Sunlight lay hidden in the garden of the three brothers. Midnight came and sunlight didn’t stir. so the brother got dressed. had made themselves into a chair. and let sunlight weight his eyes. and the blackbird chair took him away. He sat perfectly still in restless movement. had made themselves into a narrow thrumming house. and the middle brother entered. and the front door shut itself tight. and the stairway became a climb of continuous arrival. born from the last breath of night. The eldest brother stepped into the garden. not a single sibling to disturb the world. John W. Sexton lives in the Republic of Ireland. His fifth poetry collection, The Offspring of the Moon, was published by Salmon Poetry in 2013. His sixth collection, Futures Pass, is forthcoming from the same publisher in 2018. In 2007 he was awarded a Patrick and Katherine Kavanagh Fellowship in Poetry. His speculative poems are widely published and some have appeared in Apex, The Edinburgh Review, The Irish Times, The Magazine of Fantasy & Science Fiction, Mirror Dance, The Pedestal Magazine, Phantom Drift, Poetry Ireland Review, Silver Blade, Star*Line and Strange Horizons. 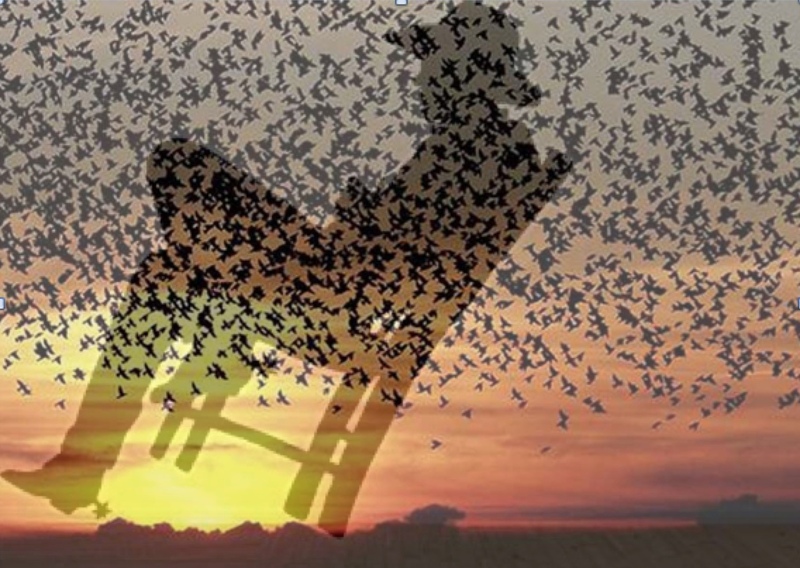 Editor’s Note: Image of blackbirds in Denmark (Willkommen in Südjütland) is combined with that of a cowboy in a chair in silhouette.